Readers, I’ve been thinking that I should probably clarify something about my footwear. I’m guessing not a single reader has pondered my footwear in their spare time, but I nonetheless want to ‘fess up. I either carry my heels with me or pick shoes out from my shoe stash at work. …oh yes, shoe stash. That’s one of my shoes stashes. Yes, that sure is a pair of slippers, because sometimes I need those too. Anyway, I’m glad we had this talk, readers. As you’ve probably guessed from reading my blog, I’m a very practical person at the end of the day. And while I am practical, I still like to have some semblance of fashion even while commuting around town…just not in my heels. Both of these have a bit more (okay, a lot more) fashionable picks than mine! It’s a bit tricky here in Chicago because it’s generally freezing cold or exceptionally hot, which I think limits us even more. Shockingly (not so shockingly? ), they did not include Uggs in either article. I’ll be the first person to tell you that my waterproof Uggs are essential for my Chicago winter commuting! Does anyone else also commute in different shoes than what they wear at work? What do you wear when commuting in extreme weather? Happy Thursday, readers! Thanks for visiting! I would be the first person to tell you that there are days when I go to work and ask a coworker, “Does this outfit seem confusing?” Readers, you know I love color, prints and patterns. I consider myself at risk for taking this love a bit too far. For many years during high school, undergraduate and graduate school, I worked at a luxury salon and spa. The dress code was black and white clothing, with a blazer required at all times. Solely gold and silver jewelry were allowed. If you were anywhere on the floor, make-up was required, as was groomed hair. 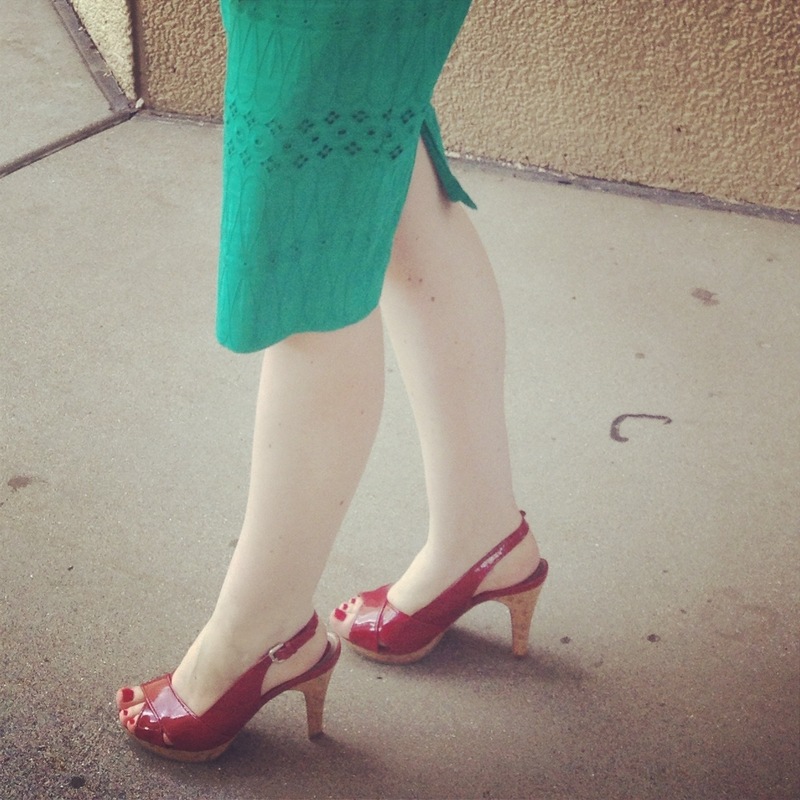 Heels were technically required, though you could get away with flats on most days. There were days when I just was not all about putting that much effort in my appearance. But, at some point, thanks to the help of the real talent there, I developed an ability to pull together all of the requirements quickly. Hair and make-up in 15 minutes? Done. Toss on some heels? Done. Mascara, dry shampoo, and hairpins are your best friends when you’re in a job that has such requirements. I think I maxed out on black and white outfits after all those years, hence my love of all things bold and bright. So, coming full circle, I may be at risk for taking bold too far and looking a bit confusing. Working in a hospital has significantly less dress code requirements, though conservative business clothes are required at all times. Luckily, I have friends who will fashion intervene if I take my bold colors too far at work. While the outfit pictured here seemed out of the box to me, I think it definitely worked! At some point throughout my many years in the salon, dressing up became internalized. I am forever grateful that the salon took me on so many years ago when I just 17 years old and taught me the value in showing up, dressing up, and being ready. I carry the same principle with me today…except now vividly in color. To make this top appropriate for work, I just added a tank top underneath it. I have yet to experiment with different colors underneath, but I think that would be another way to wear this top in a different/new way. H&M has really great sales, and this top was no exception! I notice a sale basically every time I am there. However, they tend to have bigger sales every few months, where essentially half the bottom level is all sale and clearance. These sales generally are ‘advertised’ with big red SALE signs down the store windows and doors, so keep an eye out! 2) I’m sure you’ve gathered by now that I am hopping on the prints and patterns bandwagon. 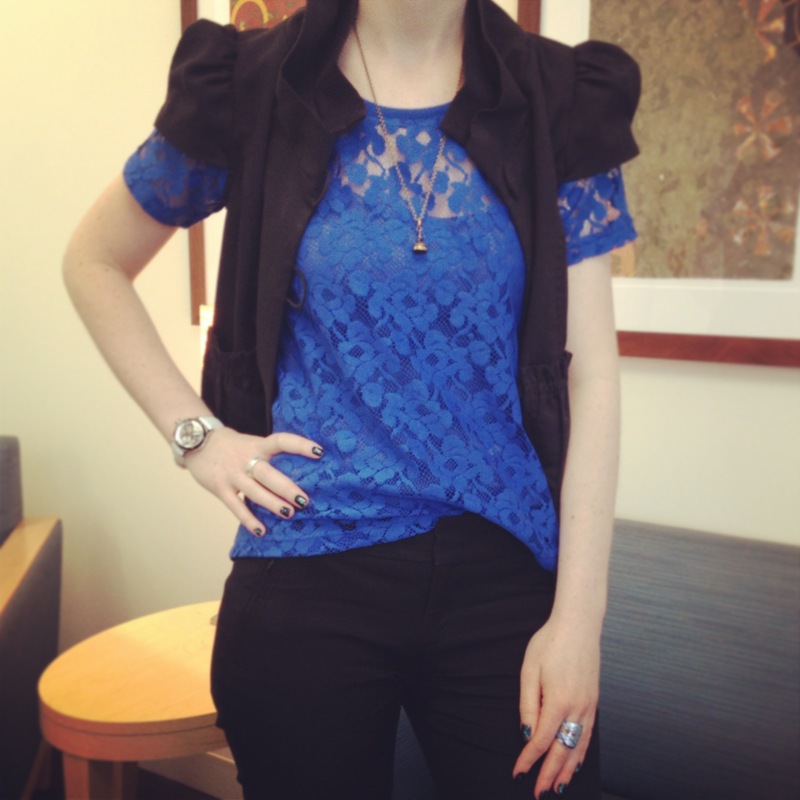 With this outfit, I took it a step further and added a new texture with the lace top. When I first put on the lace top, I think maybe it was too many differences (fabrics, colors, patterns), but I think it was a success! If you’re wanting to change up one of your looks or pieces, consider adding a textured fabric (lace, tweed, herringbone, etc). 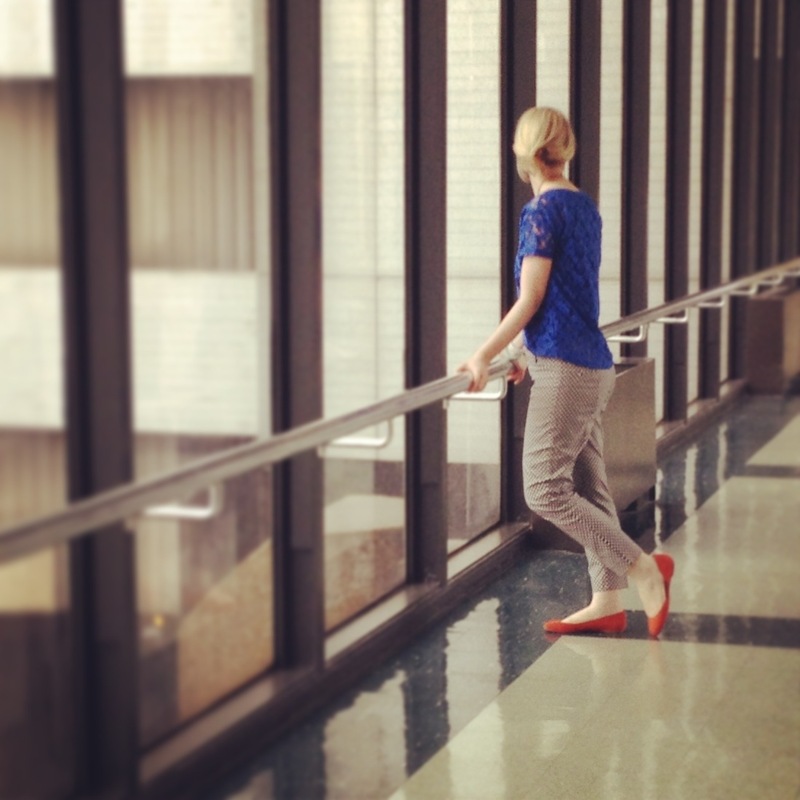 There are some great fall 2013 overviews here and here that review mismatch and mixed fabrics. What do you think about mixing fabrics? If you do mix, what are your favorite fabrics? I’ve been feeling so disorganized lately, but one thing that I try to keep constant is at least the appearance of organization! Though the skirt was a bit wrinkled by the end of the day (as you can see in the photo), I did look a bit more organized than I felt. To combat my scattered feeling, I wore one of my favorite silk tops from Banana Republic with a gray pencil skirt, and a mini jacket. I added my necklace that I call my “Little Mermaid” necklace because I think Ariel would proudly wear it (at least on land). I added my gray bow shoes to pull the whole look together. 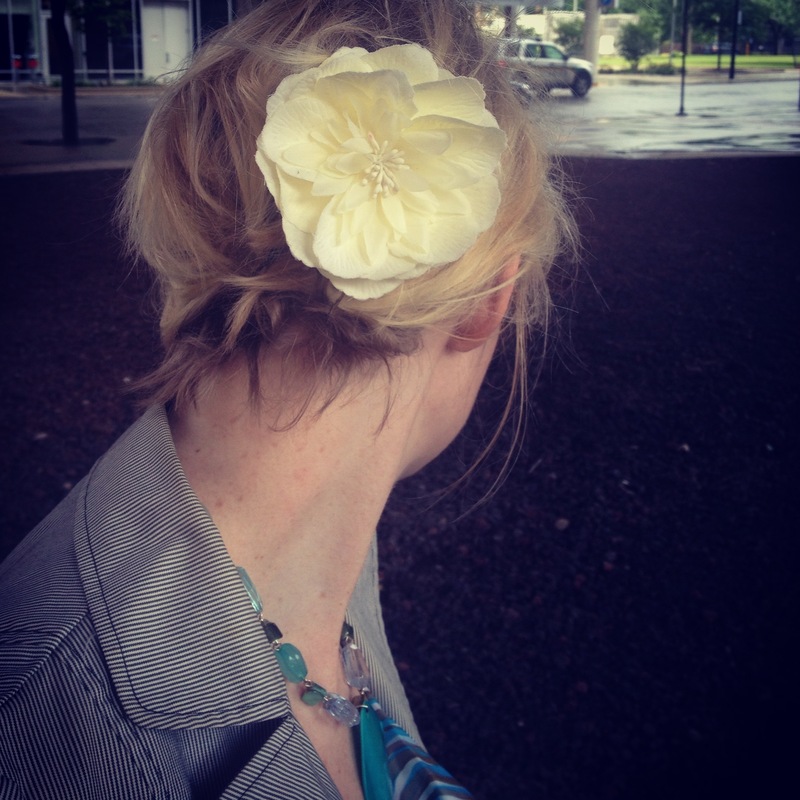 My finishing touch was a flower pin in my hair because it was so hot and humid outside, I figured pulling my hair back was the best option to camouflage frizzy hair (sort-of worked!). 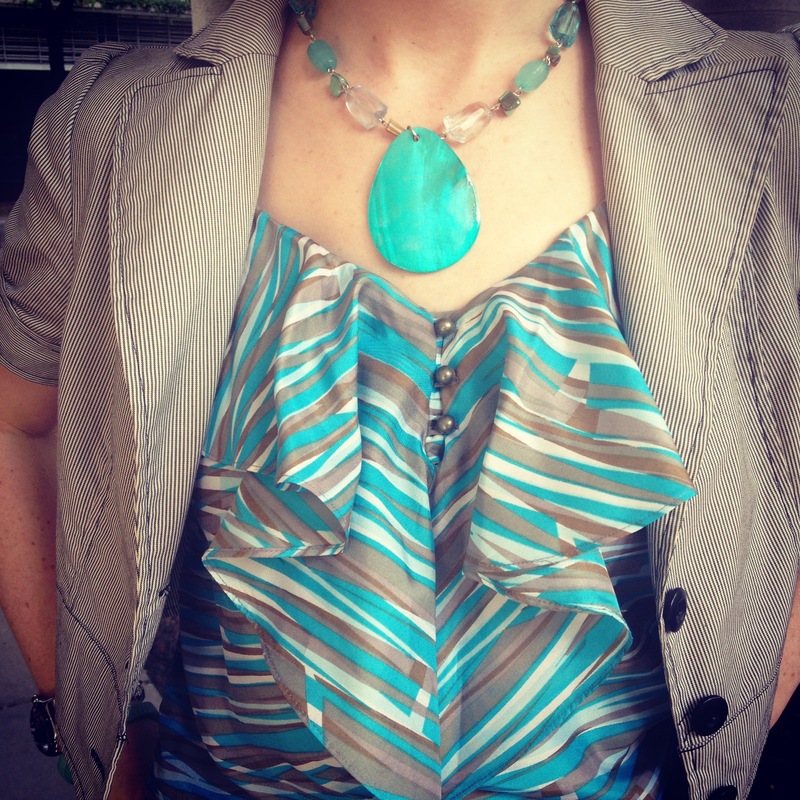 My keeping it together in turquoise outfit was complete! 1) Everything pictured here is at least a few years old, minus the pencil skirt from Banana Republic. 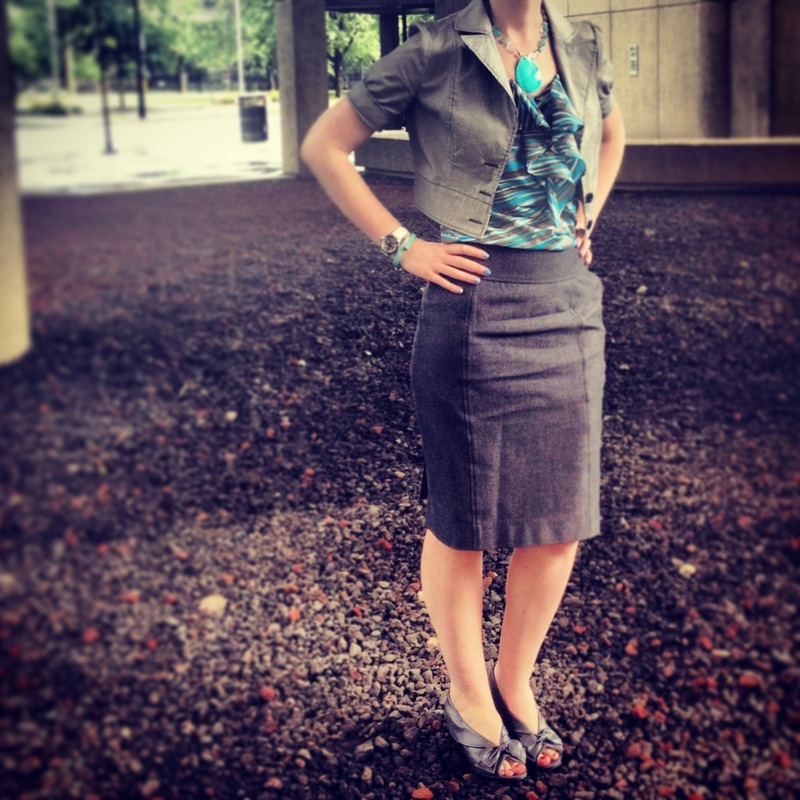 For this look, I went to my closet and picked out items in turquoise and gray. Then, I just hung them up next to each other and put together an outfit from what I had picked out. 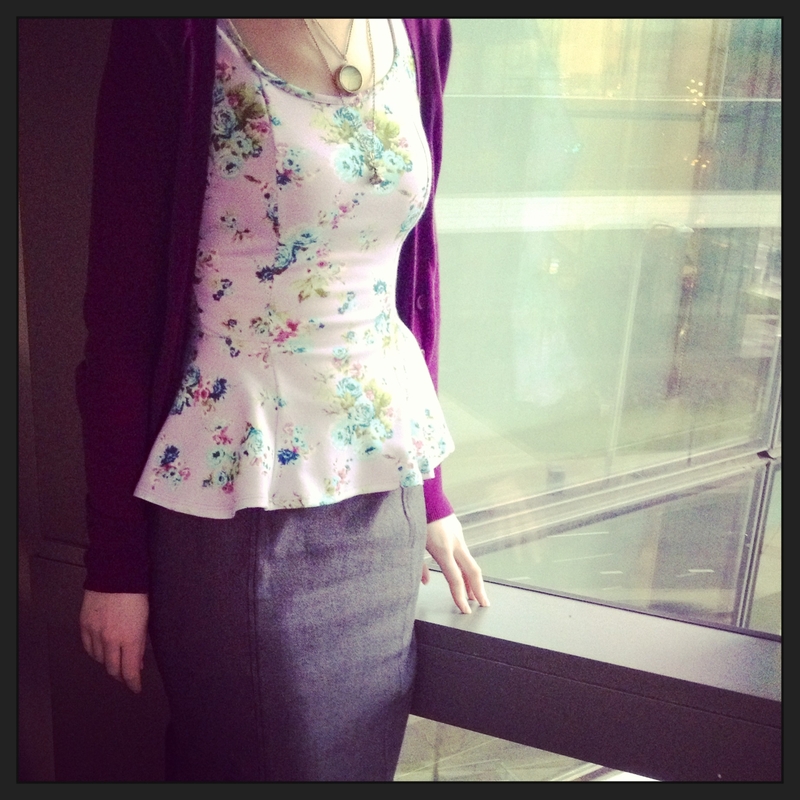 I last featured this skirt on my post about peplum (pictured below). I think a full skirt in black or gray, and a pencil skirt in black or gray both go a long way on days when you just want to pick something out of your closet and head out the door, while still looking pulled together. I keep an eye out for basic skirts when they go on sale for that very reason- it’s a quick solution to the “I have nothing to wear” conundrum we all face some days. These can be found at any major chain store. I like Banana Republic and J Crew for durable, classic skirts. Both stores have great sales- and J Crew has a great sale right now for discounts on their already reduced items. 2) I’ve noticed recently that in some stores, their sale section is essentially all over the store and easily visible. However, in other stores, it’s a bit more hidden. In my local Banana Republic in downtown Chicago, it was moved to the fourth floor (yes, it’s four stories!). I went in to the store a number of times and just thought they weren’t having a sale, until a sales rep said, “Did you make it up to the secret sale section?” ….say what? Secret sale section? Well, I ventured up there and the next sales rep said, “You found us all the way up here!” Hmm…so it seems as though they are hiding, or at least not advertising, a giant room with all of their sale items. It always pays to look completely around the store (and apparently four stories up) to see where the sale items are housed. What do you do when you face the “I have nothing to wear” conundrum in the morning? 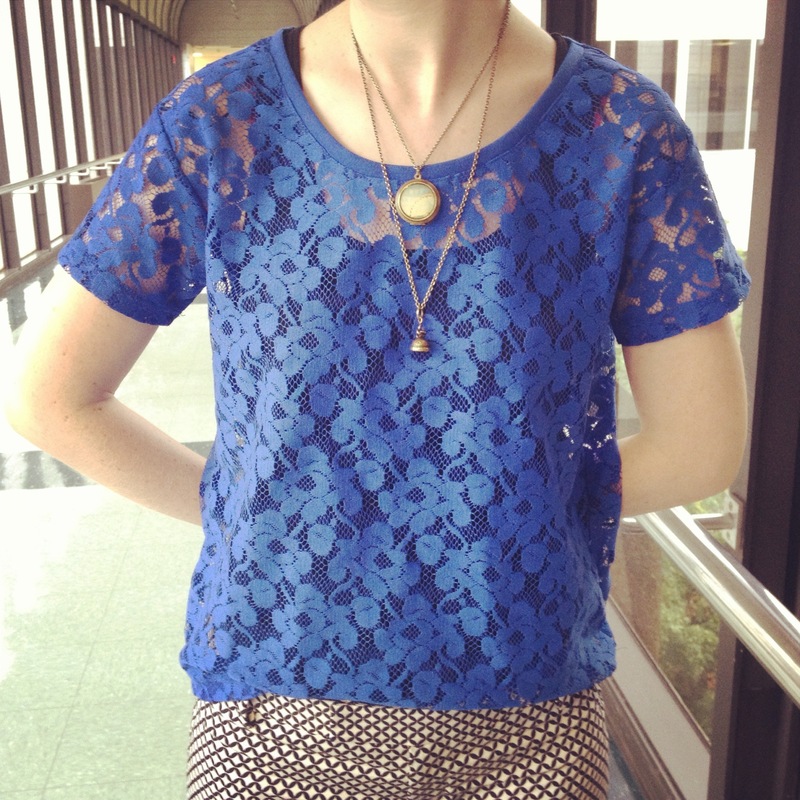 Do you have any go-to outfits when you’re dashing out the door? Happy mid-week readers! Thank you for visiting and reading!! These posts are all about showing how I’ve been rotating some favorite pieces to refresh outfits and make them look new again. Rotation is a key part of keeping your looks fresh, while still being budget friendly. In this post, I feature two basic black pieces that I rotate regularly: black leggings and a black blazer. If you want to see my previous editions of remix and rematch, you can click here, here, here, and here. 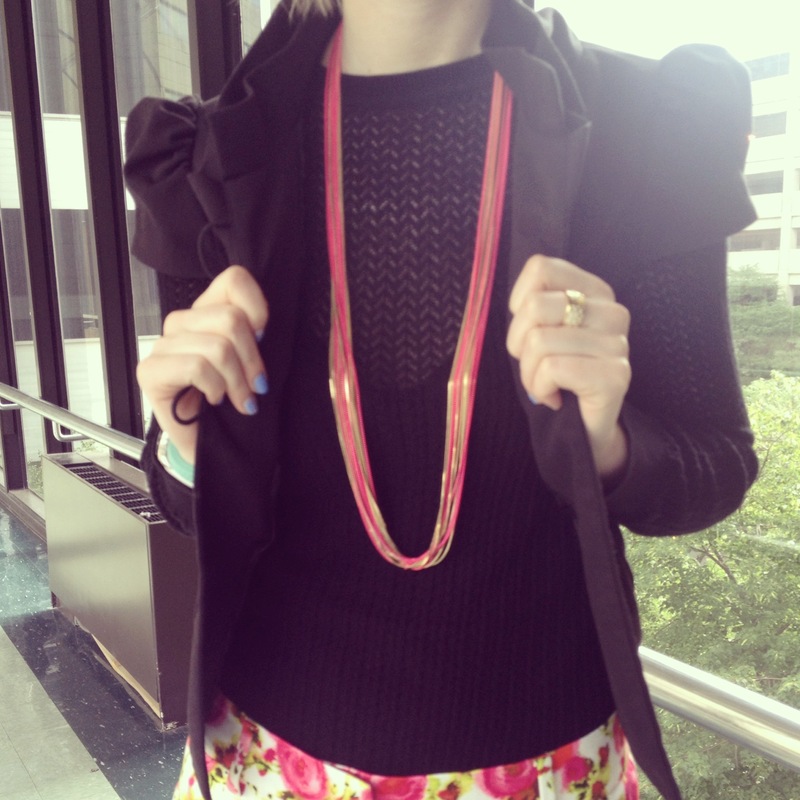 1) You cannot go wrong with a black blazer at work. I think blazers instantly dress-up any look, especially for work. They are also a great way to make sleeveless dresses work appropriate, so you can get more use out of them. Though the Forever 21 blazer pictured here is not particularly “high-end,” I love the ruffled shoulders and stand-up collar. The structural details add a lot of visual interest to any outfit, and can make casual dresses look more formal. I also like the short sleeved blazer for spring and summer to keep cool. However, it also transitions well to fall and winter by simply adding long sleeves underneath. 2) Black leggings and tights are essentials here in Chicago, especially if you’re like me and insist on wearing skirts and dresses year round. 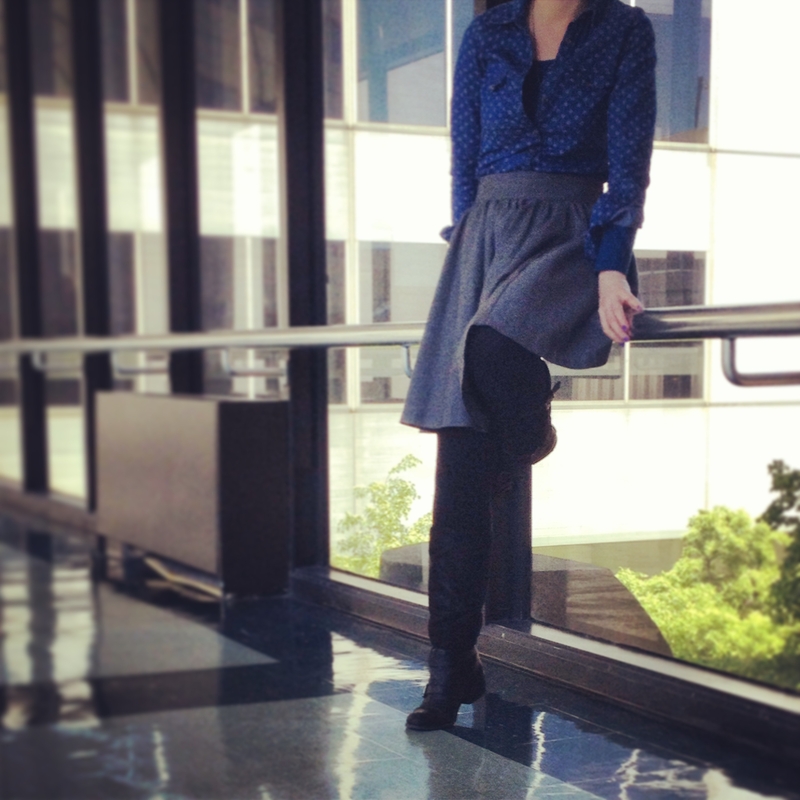 Tights and leggings are one of the easiest ways to transition your skirts and dresses through the various seasons. Leggings in particular are a good way to combat office air conditioning in summer and still wear your dresses and skirts. My Old Navy leggings have been washed hundreds of times, and just now, after four years, have a tiny hole! …and let’s be honest, I love them, so I’ll probably just toss a stitch in them to make them as good as new. I don’t think you have to spend a fortune on leggings. Just get a pair that you like that you can wash and dry without worry of pilling (none of this hand washing business). 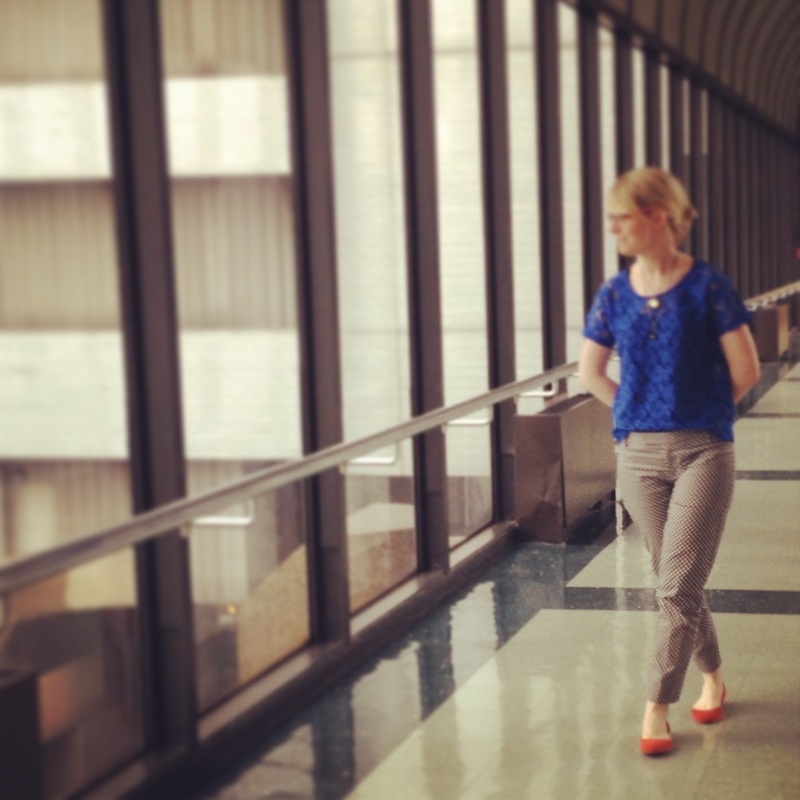 I like Old Navy for leggings, as well as the brand Hue, which can be found at Nordstrom Rack. Happy Monday, readers! Thanks for visiting!! I posted about these pants yesterday in my “let’s get legit” post and now am showing how I styled these boldly bright pants! 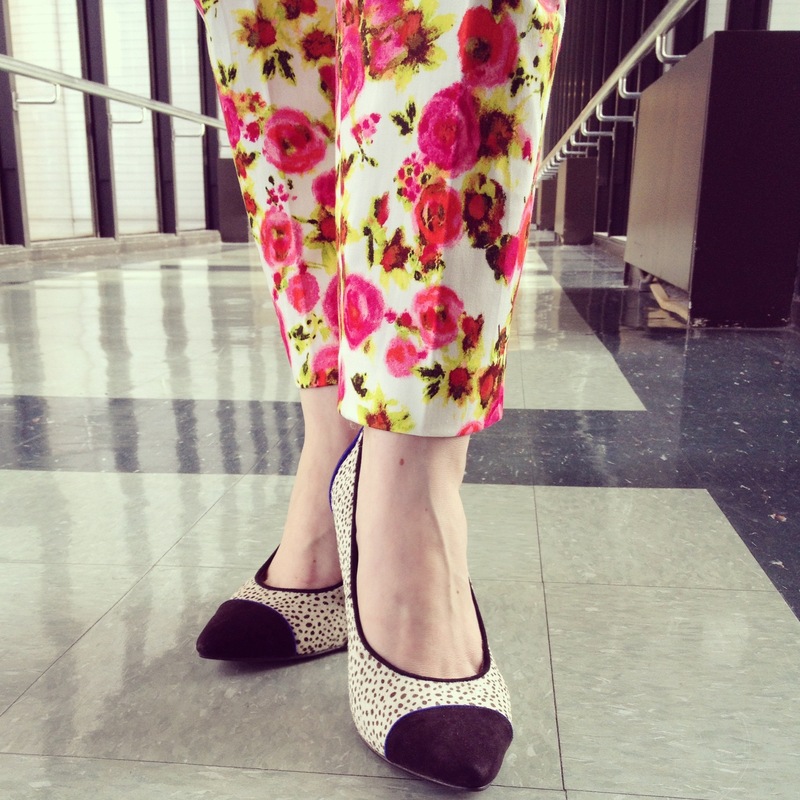 When I first saw these pants at Ann Taylor, I hesitated to try them on. I actually saw them twice in the past, but apparently third time’s a charm. I finally tried them on and loved them! And frankly, marked down to $11 from $80, you couldn’t really beat the price. Because of the bold print and colors, I kept everything else simple (shoes, top, blazer). Throughout the day, people approached me with feedback, which I think is great! The feedback ended up about 50/50 with suggestions of wearing a bold top versus all black on top. I got, “Oh wow! I love how you kept the top simple!” And then 5 minutes later from someone else, “Why didn’t you just take it all the way with a bold top?” The best part is that I think there are a ton of ways to style these pants- both simple and bold! I’ll go bold next time! Top: Nordstrom from ….10 years ago at the Anniversary Sale! 1) As I said, I looked past these pants on two separate occasions before I finally tried them on. I write this all the time, but you really never know what something is going to look like until you try it on! Ann Taylor continues to have a great sale right now, and has a ton of pants on sale- everything is 60% off their sale section (including online). You can visit the sale online here. 2) I am still not completely sure how I will wear these pants in fall, but I’m thinking I will pair them with booties and big cable sweaters. As with this summer version, I think bright colors as well as neutral colors (black and cream) will look great with these pants for fall. I have my eye out for cable sweaters now! This is a great time of year for summer sale shopping, but you can look for items that you can transition into fall- even brightly colored floral pants! Readers, what do you think? 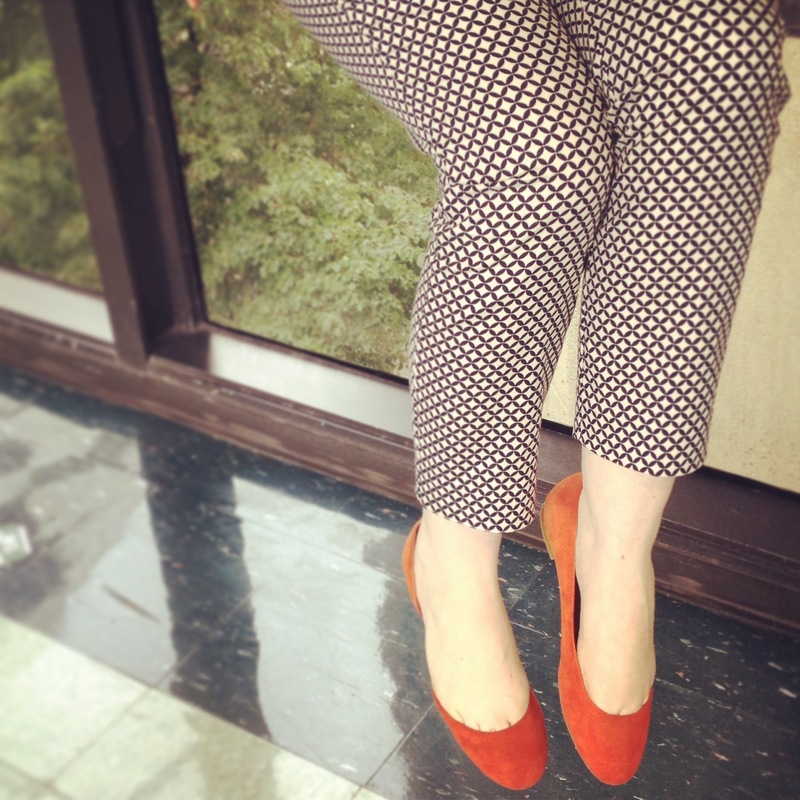 Do you like neutrals with printed/bold pants? Or do you prefer to take the look all the way by wearing an all bright ensemble? Happy Monday! Hope everyone is having a good start to their week! Finally! I pulled out my white pants this summer! 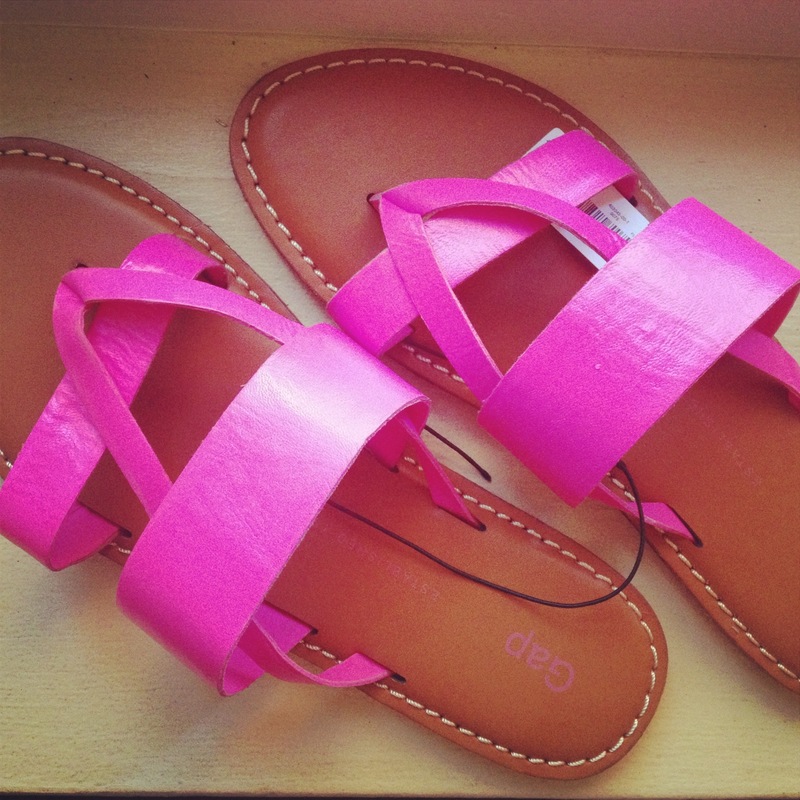 …and of course, I managed to spill pink lemonade on them the same day. These things always happen on a white pants day, right? But fear not, a bit of bleach later, and the pants are good to go again! 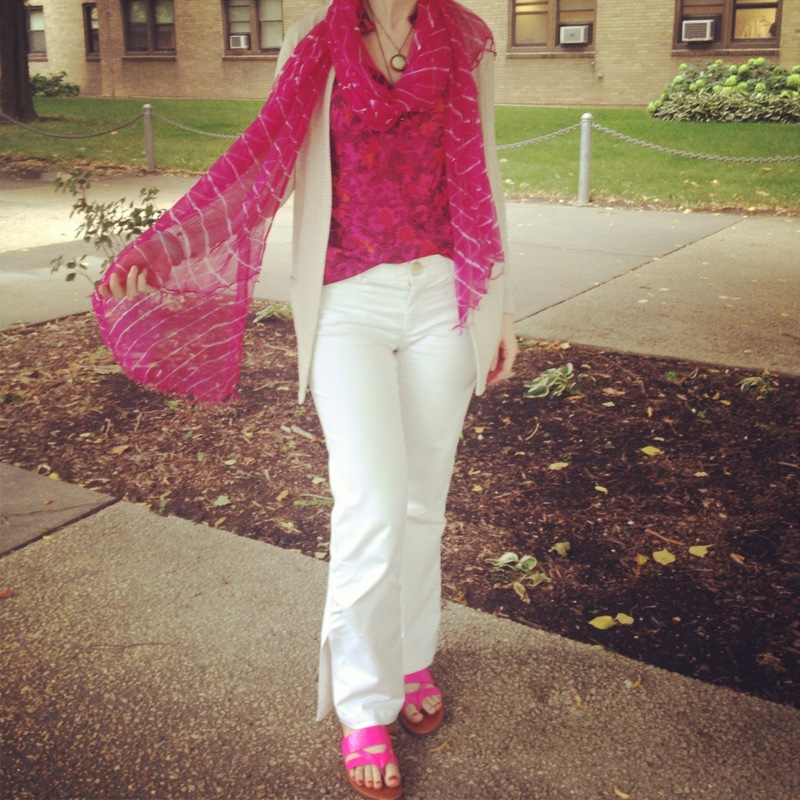 Anyway, aside from that minor incident, I loved wearing my white pants with all pink accessories. 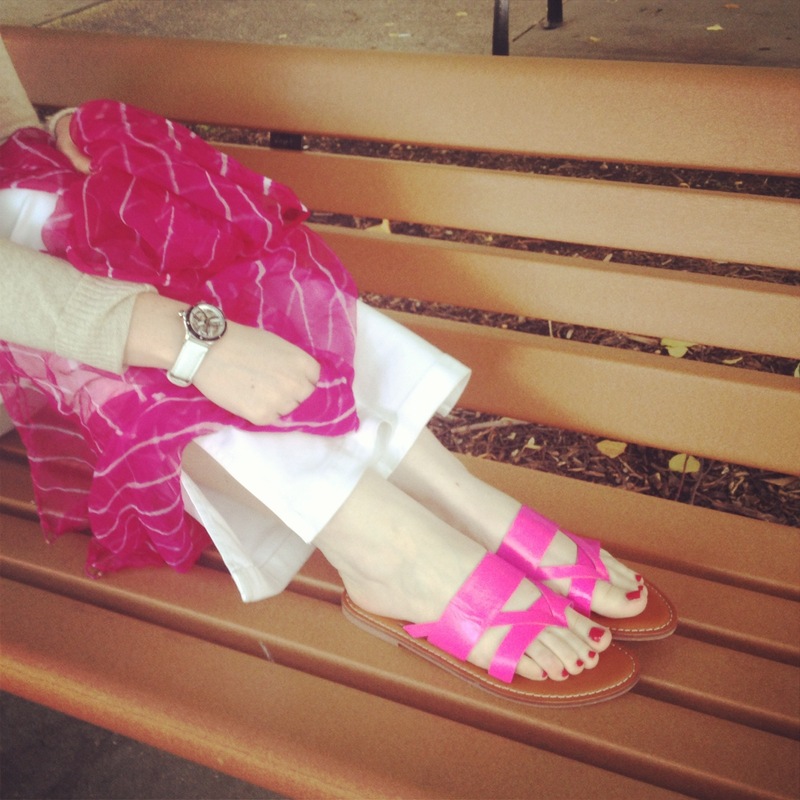 My inspiration for this peppy in pink outfit were these hot pink sandals I found at Gap for $8. I added a silk scarf that my girlfriend got me while on a trip to India. It is so lightweight and delicate- I love it! The scarf matched my top from Banana Republic perfectly! 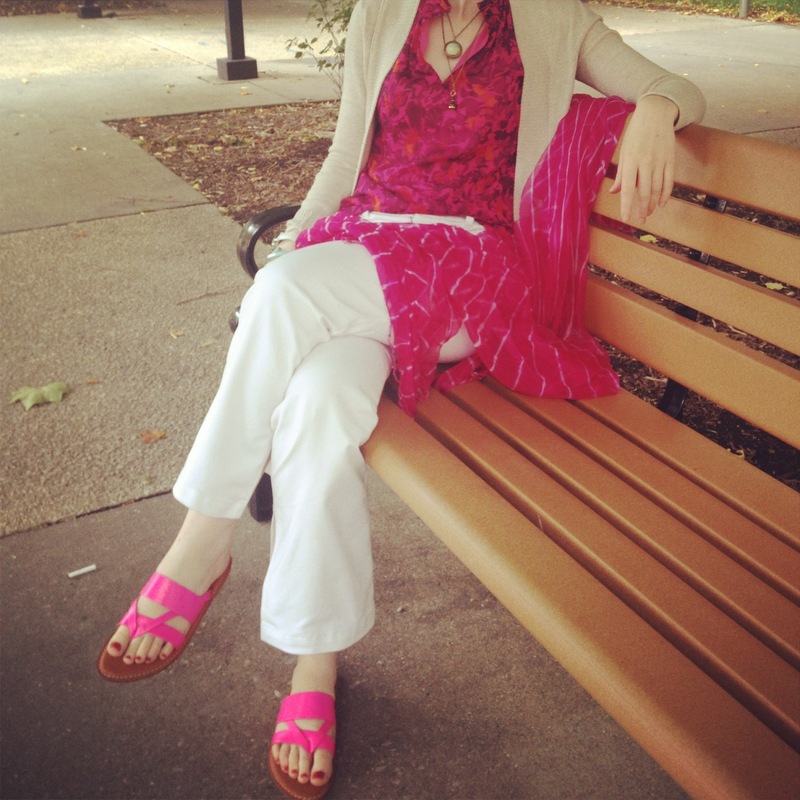 Because the top is sleeveless, I wore a long cream cardigan on top, which helped keep the look work appropriate, but also from looking too pink…if there is such a thing. 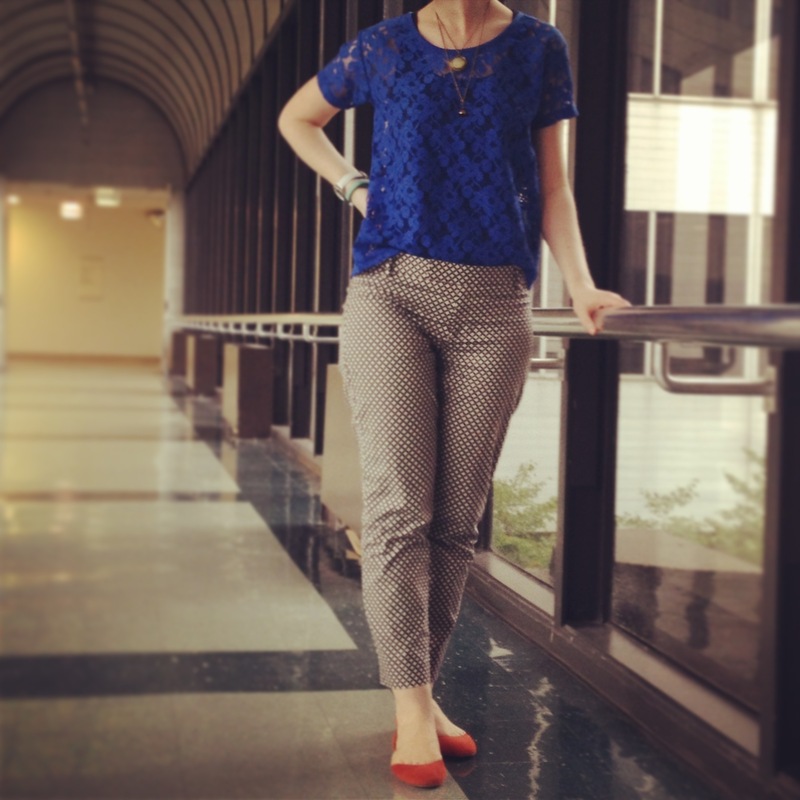 Pants: Banana Republic; my sister gave them to me! 1) I suppose that there is such a thing as too much pink in one outfit. The way I kept this look from getting too out of control pink was by wearing a long cream cardigan with the white pants. I think long cardigans in cream/white and black are essential for all seasons. I wear this particular cardigan year round, especially with bright colors. Because we cannot wear sleeveless tops at work, black and cream cardigans are my faithful standbys. I even keep two at work! 2) We have had a “cold” streak here in Chicago this summer, so I pulled out a few of my lightweight scarves to change up some of my outfits. I think summer scarves are a great way to accessorize some of your summer staples in a new way. 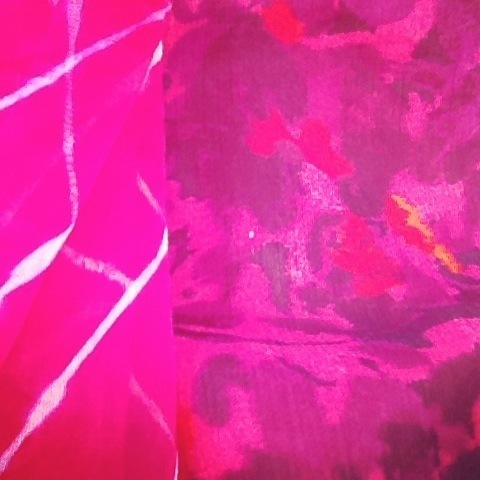 While it does sound like a misnomer, summer scarves do exist! I tend to think of them as sheer, silk, and/or lightweight. Here’s a good article about different versions of the summer scarf. Here’s a good article about different ways to tie and use your summer scarves. What do you guys think? Such a thing as too much of one color? What about summer scarves? I’d love to hear your thoughts! Thank you for visiting!! Last night when I was waiting to meet a friend, I popped into H&M. It just so happens he works next door, I swear! Anyway, after a very disappointing blue shoe search at the Nordstrom Anniversary Sale, I found these gems at H&M, for …wait for it….$10. There were ton of these left at my local H&M, as well as a few other pairs of heels, so definitely go check out your local shop, if you are in the market for blue heels. They were originally $30, marked down to $10 and in the exact shade I had been looking for the past few weeks. 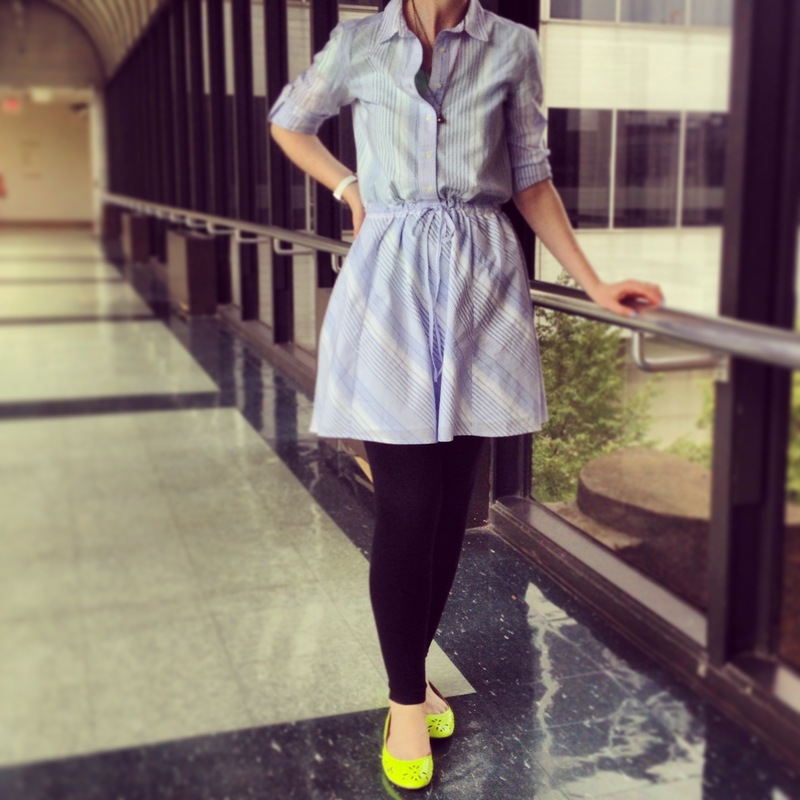 I paired these fortuitously found blue shoes with my oldie but goodie Vena Cava for Gap dress from 2009. This dress is a wee bit snug these days, but I just cannot bear to part with it because I love it so. I also added my ever faithful black leggings with zippers at the ankles. I kept my jewelry simple given the busy design of the dress. I wore my long necklace and Coach ring from many years back, as well. 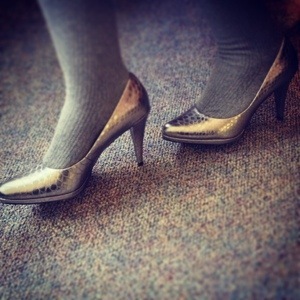 Because I am still breaking the blue shoes in, I had my black kitten heels on hand, as well. I actually liked the dress with the black heels too, though I preferred the blue while I could tolerate to break them in…what we won’t do for fashion, right? 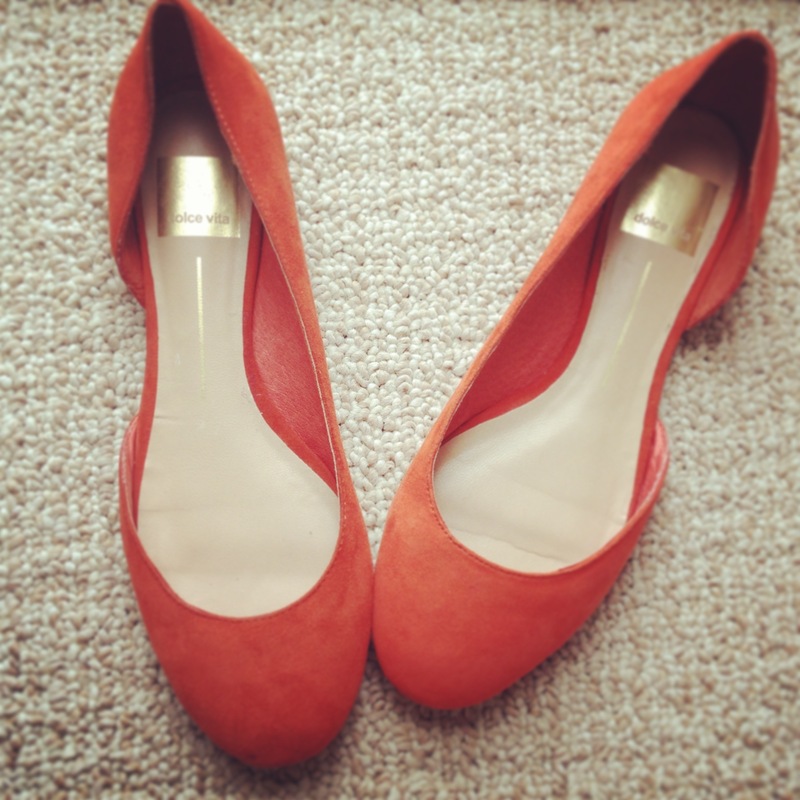 1) I searched high and low for a pair of brightly colored blue heels on sale before finding them unexpectedly at H&M. The quality seemed pretty good to me, given that they are reinforced with a thick rubber sole. Thus, the blue shoes seemed like a reasonable heel to me. If I’m buying a pair of shoes that may not be super high quality, I look to see whether the sole is sturdy or whether it will wear down after walking in them for a bit. 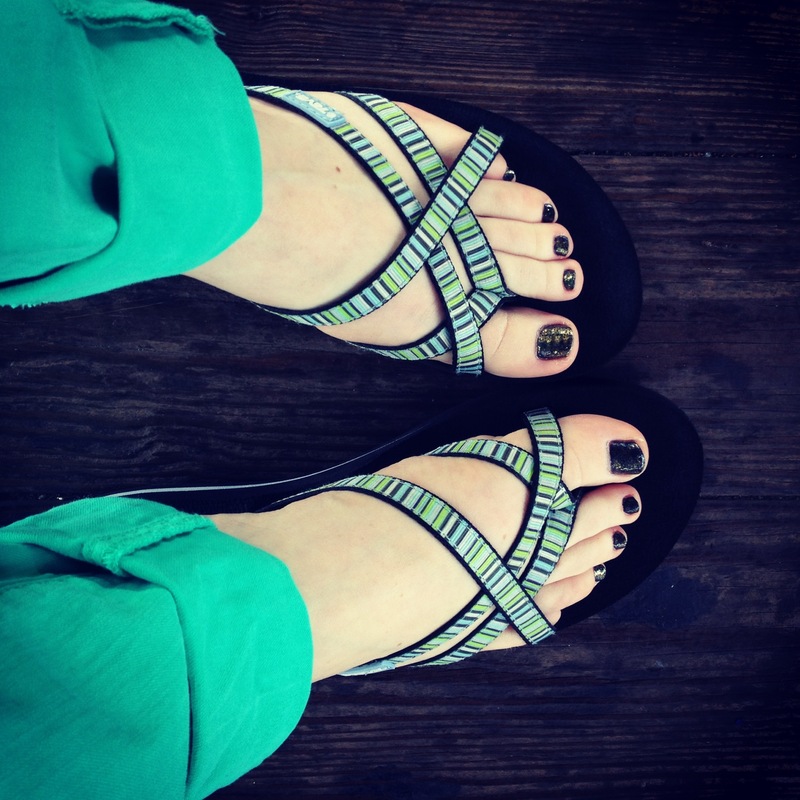 Thin rubber, especially in flats, can wear down really quickly. In heels, however, as long as the sole is sturdy, the shoe should hold up just fine, especially with a thick heel. Even with high end flats, I’ve had problems with soles wearing right out (i.e. 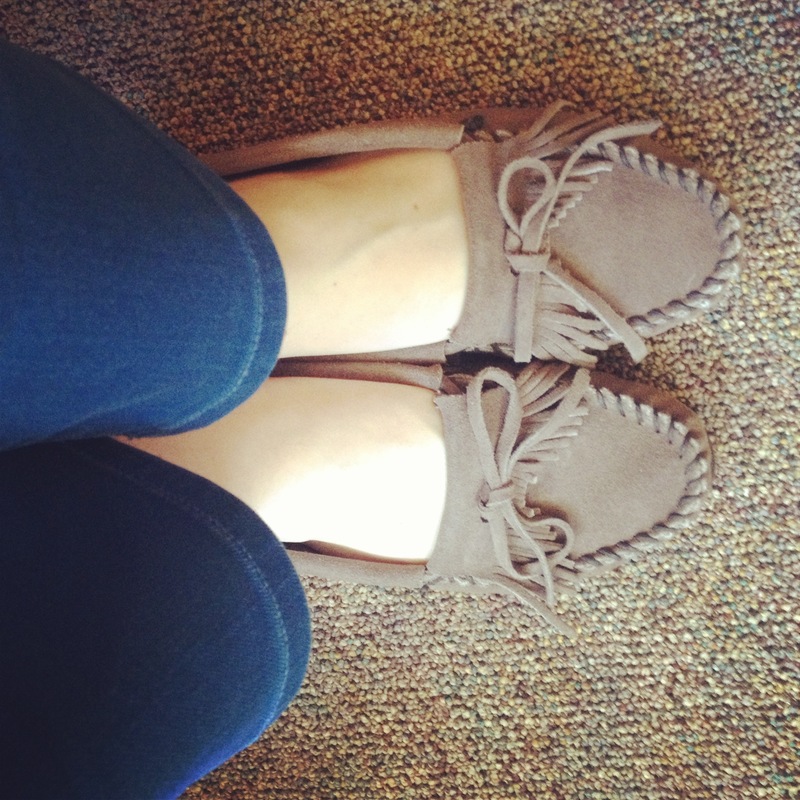 my Ugg ballet flats), so just look thoroughly at the sole before you purchase them. 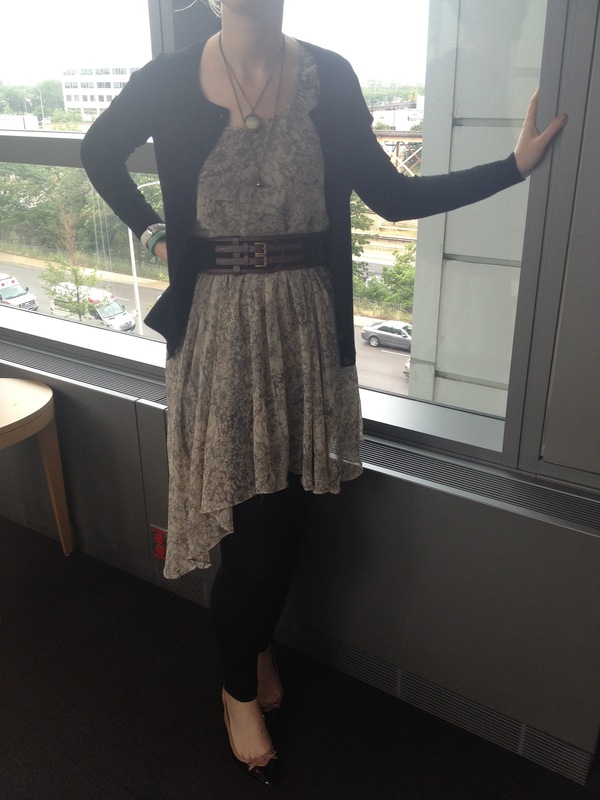 2) This dress is a bit on the short side for work. You guys know what I do in those instances, just add leggings or tights! 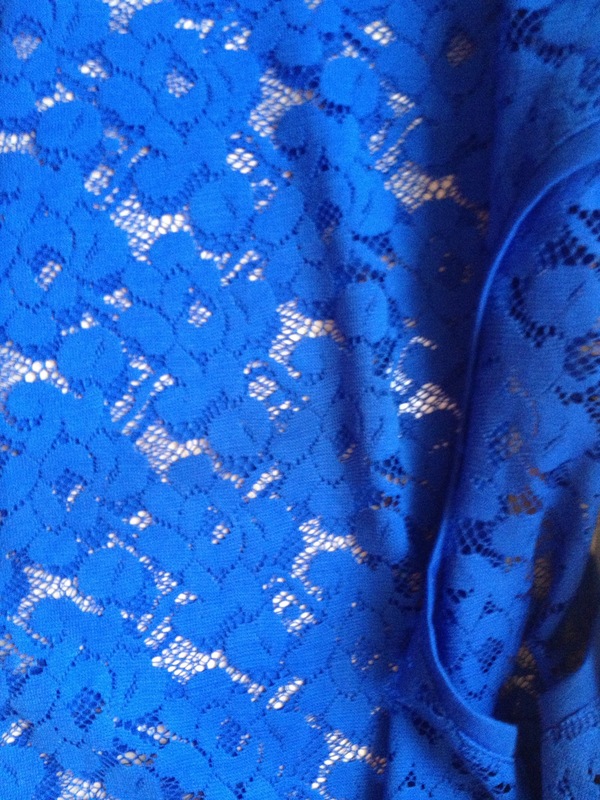 This dress without tights, but with the blue shoes, would definitely not be okay for work. However, I can easily transition the look from day to night by just ditching the tights. While safari looks have “gone in” and “gone out” and maybe come back in again (? ), I have kept this dress through the years. 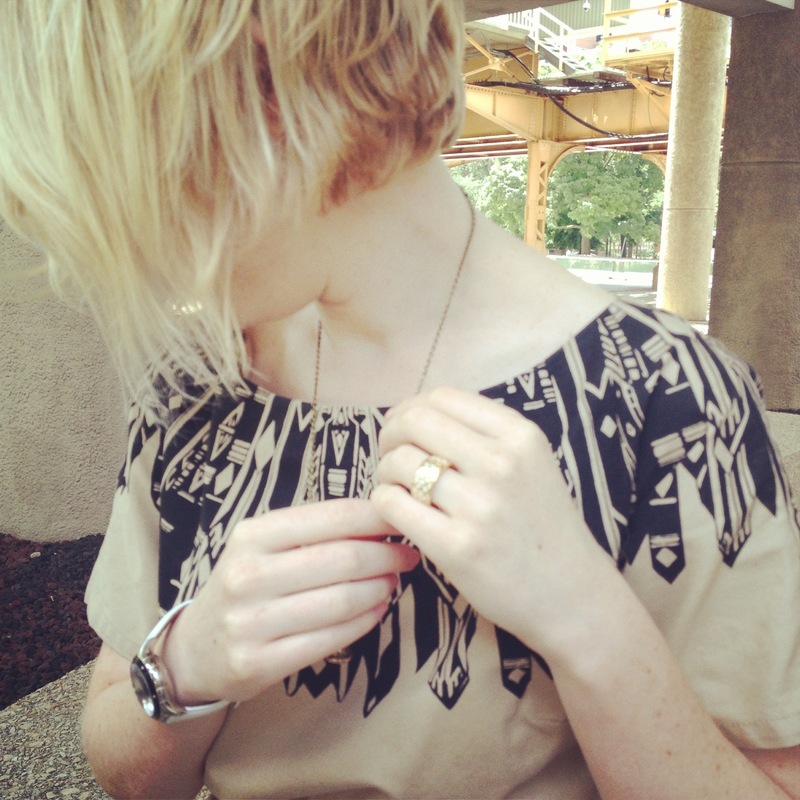 I love it, and end up wearing it every season, regardless of where the safari trend is sitting (in or out). If you love something, keep it! Wear it! And, always, enjoy it! Thank you for stopping by readers!